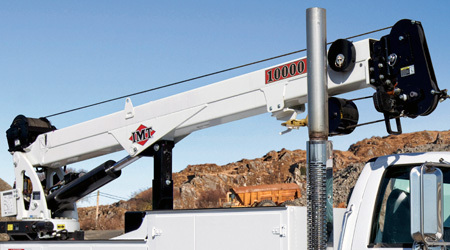 IMT telescopic cranes take on heavy lifting out in the field and are designed to integrate with IMT Service Trucks. IMT also manufacturers as line of Electric Cranes as well as Articulating Cranes. Click on a crane below for more information. IMT 1015 15' 0" 3, 200 lbs. IMT 2020 15' 0" 5, 000 lbs. IMT 2020 20' 0" 5, 000 lbs. IMT 2820 20' 6" 5, 000 lbs. IMT 3820 20' 6" 7, 500 lbs. IMT 6000 22' 6" 6, 000 lbs. IMT 7500 22' 6" 7, 500 lbs. IMT 7500 30' 10" 7, 500 lbs. IMT 8600 22' 6" 8, 600 lbs. IMT 8600 30' 10" 8, 600 lbs. IMT 9500 24' 9" 9, 500 lbs. IMT 9500 30' 10" 9, 500 lbs. IMT 10000 24' 9" 10, 000 lbs. IMT 10000 30' 10" 10, 000 lbs. IMT 12000 31' 0" 12, 000 lbs. IMT 12000 24' 5" 12, 000 lbs. IMT 14000 31' 0" 14, 000 lbs. IMT 14000 24' 5" 14, 000 lbs.